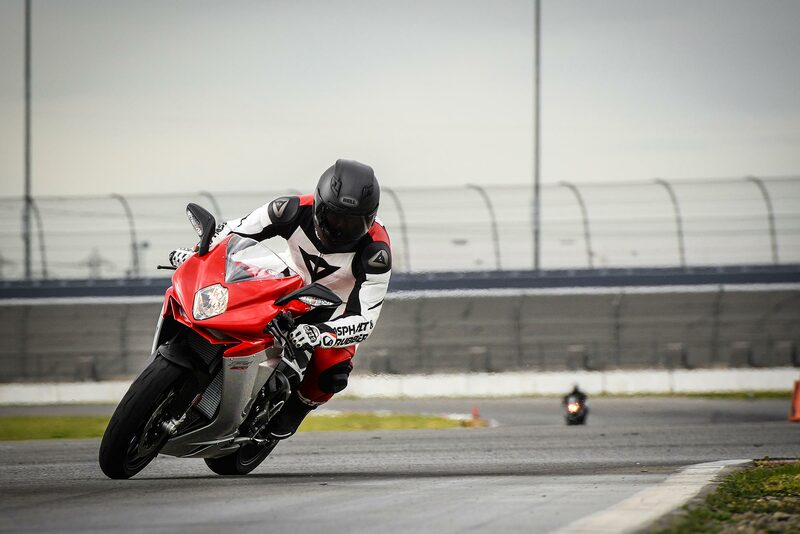 MV Agusta USA recently invited a slew of journalists down to Fontana, California in order to talk about the company’s new business plan, and to ride its current lineup of motorcycles on the infield course. This article is “Part 1” of that experience, as I wanted to separate my thoughts on MV Agusta, MV Agusta USA, and the general motorcycling climate into one story, and then have my “not-a-review” of the machines for another article. Got it? Ok, let’s go. It is probably easiest to start with where MV Agusta is as a company. It has been over four years now since Harley-Davidson divested itself of the Italian brand, “selling” the company back to the Castiglioni family. Just a year later, the younger Giovanni Castiglioni found himself in control of the company, after his father Claudio’s passing. More recently, the company has a started a new three-year business plan, which sees MV Agusta pushing into a full-range of motorcycles, pushing outside of its Italian boundaries, and pushing out of the “luxury” brand segment. By 2018, MV Agusta aims to be selling 20,000 units worldwide, with an eye on that growth coming from the American, Brazilian, and Asian markets. In our meeting, MV Agusta was not bashful about referencing Ducati as an analog, which makes sense as MV Agusta faces the same problems Ducati faced, say a decade ago. MV Agusta has some things strongly in its favor. The company got a fresh start financially from Harley-Davidson, and was left as a company that was set to operate efficiently (word is MV Agusta was an expert at burning cash, pre-Harley-Davidson). Lenders have been wary of the Italian marque ever since the Castiglioni’s re-acquired it, but the recent investments of Mercedes-AMG and Banca Popolare di Milano have helped give the company the capital it needs to expand on its next steps. This brings us to the MV Agusta’s American operations, which will be increasingly important in the next few years. First off, the old company has basically been gutted, with Helen Vasilevski appointed as MV Agusta USA’s new CEO. Equal parts industry veteran (Ducati and BRP) and outside opinion (Diageo Liquor and Procter & Gamble), Vasilevski brings to the table enough knowledge to understand the in’s and out’s of the motorcycle industry, without being indoctrinated into the sector’s bad business habits. A quick look around the room at our press gathering, and the mix of journalists is refreshingly insight: the usual four or five print publications “of record”, the top motorcycle portal sites, the hot motorcycle blogs, and even the inclusion of a smaller female-focused publication — it was a mix of blue chips and performance stocks, exactly what you’d expect from an MBA. I asked Vasilevski how she picked this mix of journalists, and she replied she paid a guy in India $20 to find the top motorcycle outlets. I was impressed, as she had perhaps the most up-to-date and forward thinking media hit list in motorcycling, and spent a pittance on it, especially when compared to the inflated marketing budgets some OEMs use with 20-year-old press lists. Another obvious talking point is the fact that Vasilevski is woman, and to my knowledge the highest ranking woman in the US motorcycle industry at this time. The American motorcycle industry has a handful of female rock stars who are breaking through motorcycling’s thick glass ceiling, which is both demoralizing since its 2015 and still a point worth talking about; and yet also uplifting, as things are obviously slowly changing in this archaic and astonishingly conservative sector. Curiously present at the event was Mario Spitzner, the Director of Marketing and Branding for Mercedes-AMG. You normally wouldn’t see someone of Spitzner’s business level at press meeting like this, especially since Mercedes-AMG only has a 25% interest in MV Agusta. In many ways AMG’s role in MV Agusta is very laissez-faire, with the German marque content to let the motorcycle company make its motorcycles. On the other hand, there is a very “German” sense of control going on here, as if Mercedes-AMG needs to keep an eye on what the Italians are doing in their playpen. The association between the two brands is supposed to be only marketing deep, but I suspect something more is there between them. Mercedes-AMG got a relatively speaking smoking deal on its investment in MV Agusta, and I suspect zie Germans are keen for a strong investment. How much hand-holding, how much financial support, and how much technology transfer is going on behind closed doors, I can only guess. I do know that the German car manufacturer is very aware of its position to MV Agusta, looking to balance the right amount of freedom with the right amount of direction. That’s all marketing BS, just so we’re clear. But, MV Agusta does have clear goals to move into the void it feels Ducati has left behind, becoming a performance driven motorcycle brand the evokes emotion — what I call product lust — with its riders. MV Agusta is aware of the company’s strong brand, and recognizes that it is the company’s size that prevents MV Agusta from leveraging the brand fully. MV Agusta wants to lead every segment it enters with the performance of its machines. They are also pricing themselves strongly against their competitors, sometimes sacrificing profits for that goal. As Ducati becomes less “Italian” in the eyes of its customers, MV Agusta wants to be the safe harbor where Italian motorcycle design rules the roost, but permeates into every motorcycle segment, with more affordable offerings. That doesn’t mean all of MV’s bikes will be cheap, take the $46,000 MV Agusta F4 RC for example, but there will be a bike at every price point. As I said before, MV Agusta has an ambitious plan of reaching 20,000 units by 2018. Not only will MV Agusta expand its core business out of Italy, namely into the USA, as well as Brazil and Asia, but the company will continue to push into new motorcycling segments. Our presentation was keen to point out that 50% of the US motorcycle market is based around touring. It should come as no surprise then that the next model to come to the USA will be the MV Agusta Turismo Veloce, due August 2015 (no, we did not get to ride it). Reading between the lines, we can expect more touring models and variations from MV Agusta, likely in different displacements, and on different sides of the Adventure-Touring / Adventure-Sport coin. With only 40 dealers in the USA, improving the dealership network is the real low-hanging fruit for the MV Agusta brand in North America, especially with the serious geographical gaps that currently exist. The harder problem is changing public perception. MV Agusta has already made headway in its dealer inventory, and quotes a 98% availability rate at its current state — more or less on par with any other European brand. In 12 to 18 months, MV Agusta hopes to have master tech at each MV Agusta dealer, a huge step in improving the customer support side of the MV Agusta ownership experience. As was talked about at length though, the public perception of the MV Agusta brand, as far as customer support, reliability, dealer support, etc is lacking. MV Agusta literally needs to run an ad campaign promoting the changes it has made for customers — and then make sure its dealerships backup that claim with vigor. MV Agusta’s motorcycle are certainly better than they have been historically, the joke being that each bike MV releases is “the best ever” from the company. That’s a joke because the bar has always been particularly low, and even still there is room for improvement from the Italian marque with its latest efforts. With the bevy of electronics on modern motorcycles though, OEMs are often able to make mid-life updates that require just a simple reflash of the ECU from the dealer — a fact MV Agusta leaned perhaps too hard on with the F3 675 launch, a machine that was unrideable at its press launch, but we ready for update by the time it came to American dealers. With MV putting that much reliance on its dealer network, it only makes sense that the dealers be as well-trained as possible, not mention, lead the charge on customer experience management. As a colleague and I discussed, BMW has had a notoriously bad track record lately with recalls and model issues, but because the brand and its dealers have taken care of its customers so well during those critically hard times, the BMW riders keep coming back. MV Agusta, and other marques, take note. I have never been particularly positive of MV Agusta under Giovanni Castiglioni’s leadership. The company is debuting too many bikes that take too long to actually come to market. When they do come, they are not ready or at the level one would expect from say a competitor like Ducati, KTM, or Triumph. These opinions of mine have made it to Varese and back, or so I’m told. Sorry for partying. That being said, I’m starting to warm up to MV Agusta. The bikes at their core are good. The company’s new three-cylinder engine really is a piece of art, especially if you ask the people who can discern such things, such a motor builders and race tuners. MV Agusta is not strong on the details, but they are slowly “getting it” — as much as an Italian motorcycle company can, as I honestly believe there are cultural issues that hold brands like Ducati and MV Agusta back on the global marketplace. With strong leadership and guidance, as well as regular access to capital, I think MV Agusta has the potential to be that other Italian brand — sorry Aprilia. A common tradition in the White House is for the outgoing President to write the incoming President two letters, with a note that if the new President should ever encounter a national problem he/she cannot fix, they should open the first letter. And if then a second national crisis comes along that the new President cannot fix, to open the second letter. As time goes on, sure enough the new President faces an issue that he cannot sidestep, so he opens the first letter. It says, “blame everything on me” and is signed by the previous President. And so the new President does so, and is able to continue onward leading the country, with effect. According to my scorecard, MV Agusta is already a letter deep into this changing of the guard. Hopefully the company’s management won’t need to look to that second letter for wisdom. Call that my reserved optimism for the brand.